I like what you did there. Great analogy. I am so glad that I do not have television. I don’t have to know this. I’ve seen a couple episodes. …best not to go there. Well said, Daniel. I recall reading ( I believe in Mel White’s 1994 autobiography “Stranger at the Gate: To Be Gay And Christian In America,” that he believed the Republican Party would turn its attention more forcefully against homosexuality with the fall of the USSR. White had, himself, been a member of the Religious Right with a wife and children, until coming out and then been essentially shunned by all the many powerful people in the Conservative movement of that time. It does seem that many people have to have someone to be angry with. As you say, it sounds so nice when love and the Bible are used as a cover for it. That is interesting. It does seem like they turned on a few internal enemies with a vengeance. It’s strange how the loss of the common enemy has in many ways seemed detrimental to American politics. If it walks and quacks like a duck it’s probably a republican right-wing moral majority bigot… errrrr, okay, just for yourself. Thank you for the reblog, Myatheistlife. I hope the net is treating you well these days. And there is nothing else to be said about the subject. Very well said. Since I have purposefully avoided the story in the media and since I enjoy your blog, I said, “I’ve got to read his thoughts on the subject — well done! Thank you, and my apologies for inflicting the story on you. This really is a moment in the muck, I suppose. I remember many years ago a Roman catholic acquaintance told me that priests don’t encourage catholics to read the bible. The reason? questioning comes from book learning. I don’t know if you read my blog post on this subject, but (IMHO) ignorance is the basis of most all the quotes from Mr. Phil regarding both homosexuality and life for blacks pre-civil rights. I found you to be thoughtful and compelling as usual, again. I like your own piece on the subject as well, and I think your comments on reading the Bible are quite apt. I wish more believers would actually read that before before they start to talk about it. I’m so tired of the twisting of blatant bigotry and intolerance into supposed truth and righteousness. 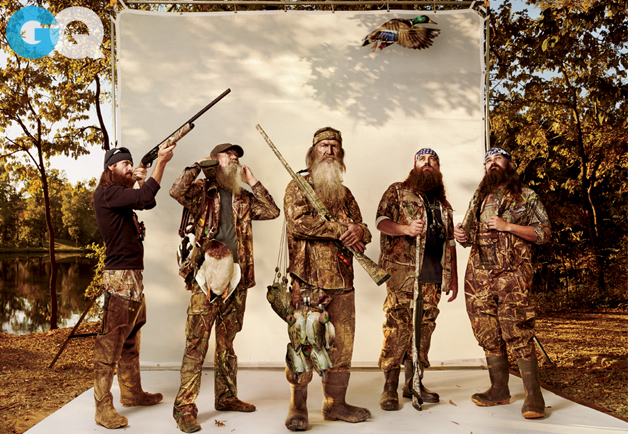 Indeed, the analogy of a fake duck call coming from a blind is beyond poignant. Well said. Thanks me. I get tired of it too. I particularly get tired of folks who play the victim after throwing the first punch. You are very kind, John. Thank you for the reblog. The Daily Kos has posted a piece where the “Dynasty’s” yuppie roots are shown. The whole thing is a marketing ploy and nothing more. These guys are frauds (on top of being ignorant assholes.) A “reality” show that is totally made up. I’m shocked, shocked. Thanks for throwing that one out there Elyse. I debated whether or not to throw a link to that piece in when I first wrote this, but I really wasn’t sure what to make of it. On the one hand, people change, and I could see someone dressing yuppy while retaining interest in hunting and fishing. In the end, I opted to just comment on the way they dress now, which does strike me as a caricature. 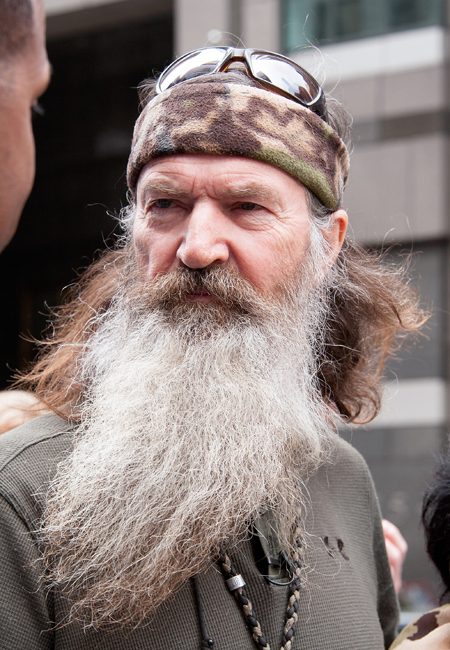 Whatever the personal trajectory, it’s damned odd to see that many people going for extreme beards. Whatever the significance of their yuppy-dressing past, the dress they opt for in the show is definitely a costume. I think it shows them as total frauds. They grew the beards and joined in the ignorant class when a buck could be had.